The Mooring Line is stretched from the Hawse Hole, between the Bitts, and on to the winch. The Rat-Tail Stopper is attached to the Base of the Bitts using a Cow Hitch. 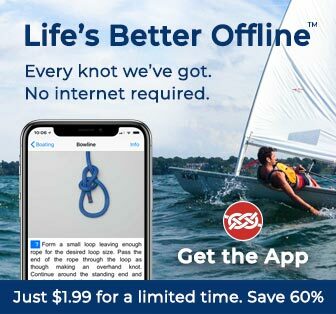 Using the two ends, a Half Knot is tied around the Mooring Line. Controlling a Mooring Line: This page describes a Mooring Line Stopper knot that temporarily takes the load while a Mooring Line is transferred from the Winch to the Bitts. The knot described here is the double-ended version. The center of the stopper line is secured to the Bitts – often an eye at the base of the Bitts. The stopper knot itself commences with a Half Knot tied around the mooring line before starting the double spiral. Demonstration Only: Because a foredeck during mooring procedures is no place for casual photography, these photographs were taken while at sea. We waited until the ship had left the Atlantic swells and was travelling east in the calmer waters of the Mediterranean and when the morning sunlight brightly illuminated the port side foredeck. The Mooring Line was led first from the Hawse Hole to the Winch and then to the Bitts. For safety and for convenience the line was not under tension. Name of the Knot: On the working deck, the abbreviated name "Stopper" is commonly used. In technical publications several names are used including: Mooring Line Stopper; Rat-Tailed Stopper; Rat Tail Stopper; and Rattail Stopper. Rat-Tail Stopper has been chosen here. Ashley describes the very similar Cross-Lashed Strap (ABOK # 1755, p 299) which also employs this double spiral. He also remarks that: Shakespeare terms this method of lashing (differently applied)"cross-gartering." Winches: There will usually be multiple winches. This allows some lines to remain permanently on their own winch. However, many lines have to be first tightened with a shared winch and then transferred to a set of Bitts to free up the winch to tighten the next line. In this picture taken of the Insignia's Forward Mooring Station, the forward winch already has two lines on it, the starboard winch has two lines on it, and the port winch is partially hidden by the ship's structure. Size and Force: The size of the Mooring Line will vary with the vessel's size. However, on Cruise Ships the diameter will typically be 2.5 - 3 inches (64 - 75 mm) or more with a breaking strain of thirty to forty tons. When tight, the force in the mooring line will be many thousands of pounds. Material: Today, mooring lines are commonly made of High Modulus Polyethylene (HMPE), which floats so that there is a reduced risk of fouling a propeller. They are also much less elastic than nylon, which reduces the "snapback" risks on the shore and on the mooring station: when a loaded nylon hawser breaks, there is sufficient energy contained in the recoiling ends to maim or kill. Even with HMPE significant risks remain. Rat-Tail Options: A single tailed stopper can be used for lighter loads. Using a single line, a couple of Half Hitches are tied around the line, followed by a length of spiral wrapping. However, the double stopper technique illustrated here would appear to be stronger, more reliable, and less likely to twist the Mooring Line. Mooring: Large ships are usually moored alongside a dock using multiple lines. All the lines run from the two work decks, one aft and one forward. Typically, four lines are run from each location. However, all these Eight Lines are usually "Doubled Up" so that Two Lines share each task. Dipping the Loop: When a line is Doubled Up, the two lines usually share the same Bollard. In addition, when two ships are moored close to each other, lines from the two ships may share a Bollard. When this occurs, Dipping the Loop allows either line to be removed first. To Dip the Loop, the second rope's eye splice is passed from beneath, up through the first rope's eye splice, and then over the Bollard. This technique allows the first rope to be lifted off first if necessary. Without this precaution, the first rope's eye can be lifted off but can only slide up and down the second mooring line. Safety: Safety is taken very seriously. Injuries are not uncommon. Standing near a line, or worse standing on a line or in a bight of line, which is being tightened or released can lead to major injuries or death. A well equipped Mooring Station often provides a safety cage around the winch operator to provide some protection from recoiling rope ends - see Frames 1 - 4. Thanks: I am indebted to Staff Captain Max Melnikov, First Bosun Oswaldo Lumelay, and AB Freddie Paz who made this photography possible during a cruise on Oceania's Insignia.